Bob is our coin counting machine. 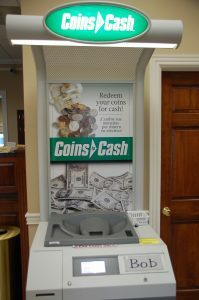 There is no need to count, roll or separate your change anymore! Drop your loose change into Bob and watch him count hundreds of coins in just seconds. Coins must be clean and free of foreign objects. Bob is another FREE service to our customers!